The Henry E. Huntington Library in Pasadena, California, is home to approximately 600 sixteenth- and seventeenth-century broadside ballads. 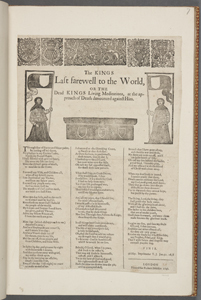 Collections at the Huntington include the Bindley (formerly Luttrell) of about 100 ballads; the Bridgewater, including about 60 ballads; and the Britwell (formerly Huth) of approximately 90 ballads. In addition to these collections, the Huntington also holds several hundred other ballads that are bound into album books alongside other types of texts, and some that are loose sheets tucked into other books or folders. Because the Huntington ballads have been collected in such different ways, the album and ballad sheet facsimiles appear less uniform than in the Pepys, Roxburghe and Euing collections. 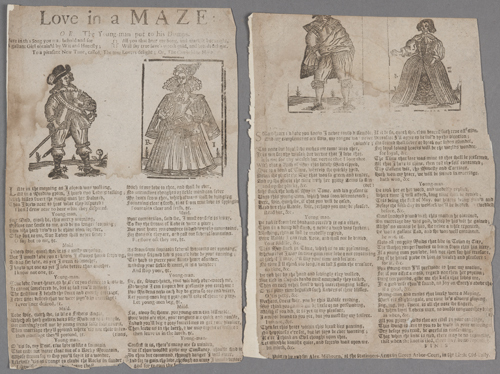 For example, the album facsimile to the right shows a ballad bound in a miscellaneous volume, while the ballad sheet facsimile below shows a ballad that is not part of any album (though it appears to have been bound at one time ). The Huntington's ballad holdings are richly diverse. They range from very early ballads of the sixteenth and seventeenth centuries (most of these are in the Britwell collection) to white-letter ballads from the later seventeenth and early eighteenth centuries. For more information, see provenance.